Haven't read the books? Oof, sorry, that whole "pseudo-wedding dress" thing probably really threw you. In Catching Fire, we meet Katniss and her fellow District 12 tribute Peeta (Josh Hutcherson) just after they've become the first dual winners of The Hunger Games, and as they prepare to embark on the forced Victory Tour through the other districts in Panem. 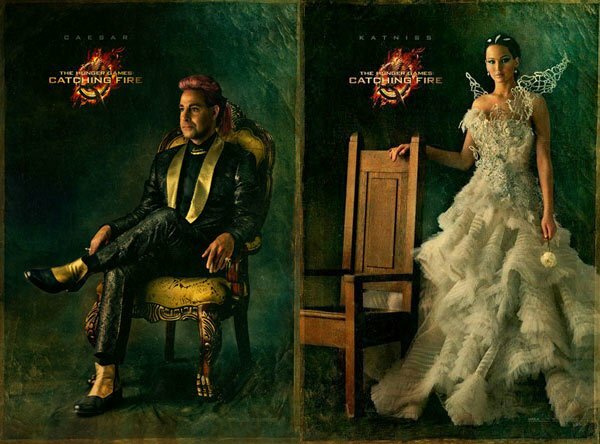 Katniss and Peeta are also pretending to be engaged for the sake of getting President Snow (Donald Sutherland) to stop breathing down their neck… but what they don't expect is to be called back into the arena as part of the Quarter Quell, a Hunger Games staged entirely with former champions in the competition. When it comes time for Katniss to do her big TV interview with Caesar, she's wearing a white dress that's supposedly her wedding gown… but there are also secrets in store, and fans of the book are surely already wondering how those will play out onscreen. Lionsgate is planning a pretty major presence for Catching Fire at Comic-Con, with a Saturday panel in Hall H, the usual red carpet interviews and press conferences, and a presence on the exhibit floor incredibly likely (two years ago I snagged a Mockingjay pin from the Lionsgate booth and was hounded by people wondering how I got it; I'm betting they make a whole lot more of them this year). And with filming on Catching Fire completed, there's no limit to the kinds of scenes they might show off. It will be interesting to see if the studio decides to go ahead and show off scenes from inside the arena where Katniss and Peeta are sent back into battle; the film's teaser trailer avoided the arena entirely, setting the stage with the glamour of the Capitol and the burgeoning revolution happening in Katniss's home of District 12. Let's revisit that below, shall we? The tactic of leaving the Games themselves out of the marketing is a holdover from the first film, which earned major attention for leaving the titular Games out of the marketing entirely; for that film they were dancing around the fact that the movie was about kids killing kids, which is less of a factor in Catching Fire (most of the veteran tributes in the Quarter Quell are adults). But the look of the Games in Catching Fire is completely different from The Hunger Games, and fans might be dying to get a look at the surreal arena where Katniss and Peeta are sent to fight… which might be enough to convince the studio to hide it away entirely. Then again, Comic-Con is often a chance for studios to show off parts of films that never make it into the marketing at all, and fans who wait in line for hours to get a look at the Catching Fire preview ought to be rewarded with something unique. We'll be there on Saturday with minute-by-minute account of what's happening in Hall H, so stay tuned, and click here for all of our Comic-Con coverage, which kicks off Wednesday.